In New York City, garden-variety complaints of police officer misconduct can be filed with the Civilian Complaint Review Board, a city-run agency with the power to investigate complaints and recommend sanctions to the police commissioner when warranted. The existence of the CCRB provides an avenue for the public to report problems other than to the courts — probably saving the city a fortune every year in judgments, settlements, and legal fees. 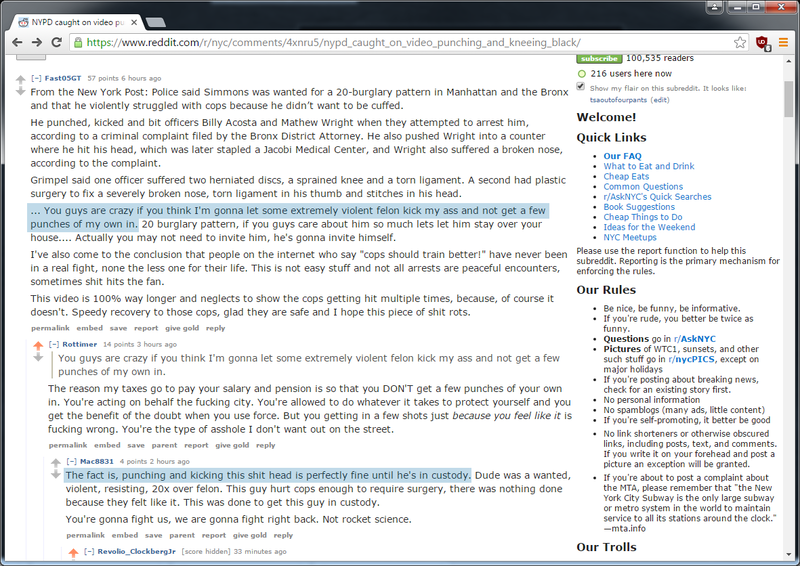 And cops wonder why the NYPD is, er, unpopular, with the people: they think they are above the law because they have a difficult job. Accountability and respect are not mutually exclusive, and the NYPD must stop this childish us-vs-them mentality with those who demand the former as a prerequisite to the latter. This is the eighth installment of a series documenting an ordinary New Yorker attempting to exercise his Second Amendment rights: Part I (license application), Part II (application rejected),Part III (the lawsuit), Part IV (appeal filed), Part V (appellate briefing complete), Part VI (N.Y. Appeals Court Not Interested in Ending NYPD Corruption), Part VII (Corruption? You Can’t Prove It!). The U.S. Supreme Court has made pretty clear that a “total ban” on any particular gun right is unconstitutional. They seem to be pretty clear that it doesn’t matter whether the total ban is only on the carrying of weapons, or on all ownership, or even on certain classes of weapons. No total bans. But, what is a “total ban?” According to the appellate court that denied my appeal last month, “New York’s handgun licensing scheme does not impose any blanket or near-total ban on gun ownership and possession.” But if an ordinary citizen with no criminal record is denied a license, denied an administrative appeal, denied a court petition, and denied an appeal of that denial, how does that not amount to a total ban for me and for every other ordinary citizen with no criminal record? What, exactly, would the state have to do to have a “total ban” in the eyes of N.Y. Supreme Court, Appellate Division? Yesterday I asked the highest court in the state, the N.Y. Court of Appeals, to settle the matter. The court appears to have passed on pretty much every gun licensing case sent its way since the U.S. Supreme Court declared in 2008 that gun ownership is an individual right that requires no militia membership, and clarified in 2010 that the Second Amendment applies to the states. The Court of Appeals’ failure to consider the issue in about a decade, after important changes in constitutional law at the federal level, have resulted in a patchwork of decisions from the trial and appellate courts, all of which have invented their own rules. Appealing to the high court of New York is actually a pleasant experience compared to New York’s intermediate appellate court, which requires 8 copies of every document with special tape binding, a PDF version with digital bookmarks, and a $315 fee, among other weird requirements. And it’s a daydream compared to the U.S. Supreme Court, which requires 40 copies (!!) of everything, a $300 filing fee, and a garbage bag (really). The Court of Appeals requires only 7 copies (double-sided ok), a $45 filing fee, and no choice of drawstring or twist-tie. One expeditor, he said, may have had ties to organized crime. Another got help with 100 gun permits over the years — “none” of which should have been approved. Here’s to hoping that while the Court of Appeals clarifies New York law, it also takes up my invitation to end the corruption in the Licensing Division.